Thank you to Trafford Archives and volunteer Richard Nelson for this post. The first direct evidence in Stretford that a war was really happening in Europe and that atrocities were being carried out was the appearance in the area of Belgian refugees. Soon after the invasion of Belgium by German forces on 4th August 1914, the first refugees and wounded started to arrive in Stretford. The Stretford Telegraph of 16th October of that year reports the arrival of 38 refugees on 12th and 24 wounded soldiers on 15th. The refugees were collected from Central Station, Manchester and met by the Chairman and Stretford Council members. A convoy of a motor bus and two horse drawn charabancs, lent by local business men, brought them to their new accommodation at Longford Hall. The adults, carrying a small package containing all their worldly possessions, presented a rather pathetic appearance, whereas the children looked as though they were enjoying the occasion. There were eight families and some single people. Most of them were Flemish speakers who came from Brussels and towns round about such as Malines and they had ordinary occupations like coal miner, carpenter and seamstress. A local party welcomed them at the Hall and included three Flemish speaking ladies and some clergy of their own faith. A local lady who spoke Flemish, Mrs Black, stayed on at the Hall for sometime to give assistance to them and they soon began to take advantage of their new-found freedom by walking nearby streets and visits to the Picturedrome in Stretford. It didn’t take long for local traders to take advantage of the situation. Advert for Jason stockings and socks. The article in the Stretford Telegraph indicated that the refugees were pleased with their new accommodation and the kindness shown to them by local people. 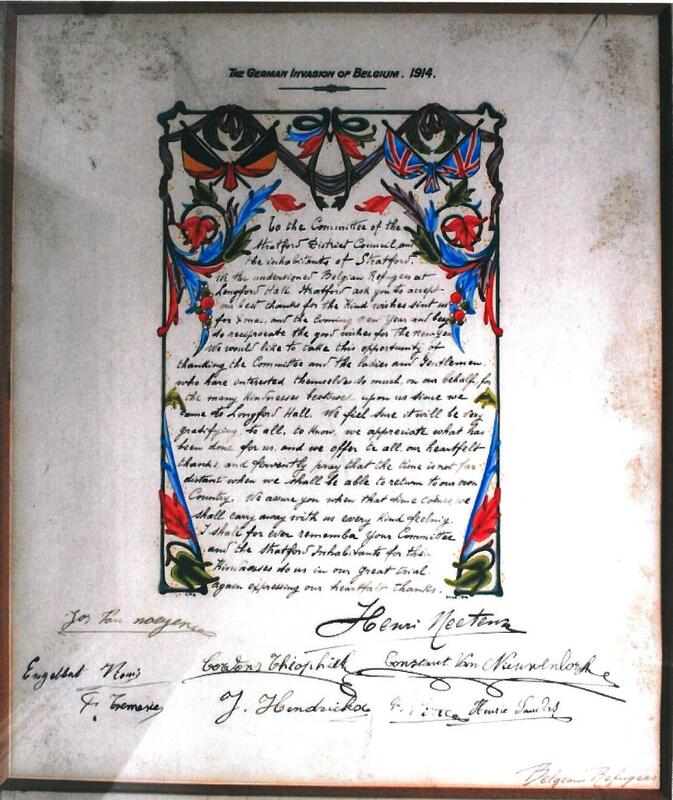 A certificate, located on http://www.traffordwardead.co.uk, drawn up by the Longford Hall refugees was decorated with both the Union Jack and Belgian flag. Signed by eight of them and dated ‘Xmas 1914’, it confirms their gratitude. They thank the Committee of the Stretford District Council and inhabitants of Stretford for their kind wishes for Christmas and the New Year and for the many kindnesses bestowed by the people of Stretford since they arrived at the Hall. They fervently pray that the time is not distant when they can return to their own country. One of the people who signed the document was Henri Neetens. It seems that he didn’t wait to return to his native country but emigrated with several other Belgian refugees from Manchester to USA on SS Lapland on 18th July 1918, leaving for New York from Liverpool. On the passenger list his age is given as 46 and his occupation as butcher. His birth place is Malines in Belgium, one of the towns mentioned in the Stretford Telegraph report. There is also a record of his marriage in Manhattan, New York on 21st September 1918. Most of the wounded men had received their wounds at Antwerp and these were mainly shrapnel wounds to the hands, though there were some more serious cases. Antwerp was besieged by the German army, subjected to heavy artillery bombardment from 28th September 1914 and finally surrendered on 9th October. The Belgians seem to have been made very welcome throughout the Trafford area. Longford Hall and The Pavilion were not the only places in which they were placed. Some of the other sites include Wibbersley Park in Flixton, Holly Bank in Hale, The Lindens and Milton House on Barrington Road in Altrincham. There is even a report of a Belgian pianist and a folk song quartet giving a concert at Bowdon Chamber Concerts at the end of October 1914. Hi. I’m writing a piece on Belgian refugees in WW1. I need to know the copyright holder of the ‘ Jason Socks for Belgian Refugees’ image that appears in your blog. Can you or anyone help? Thanks in anticipation. 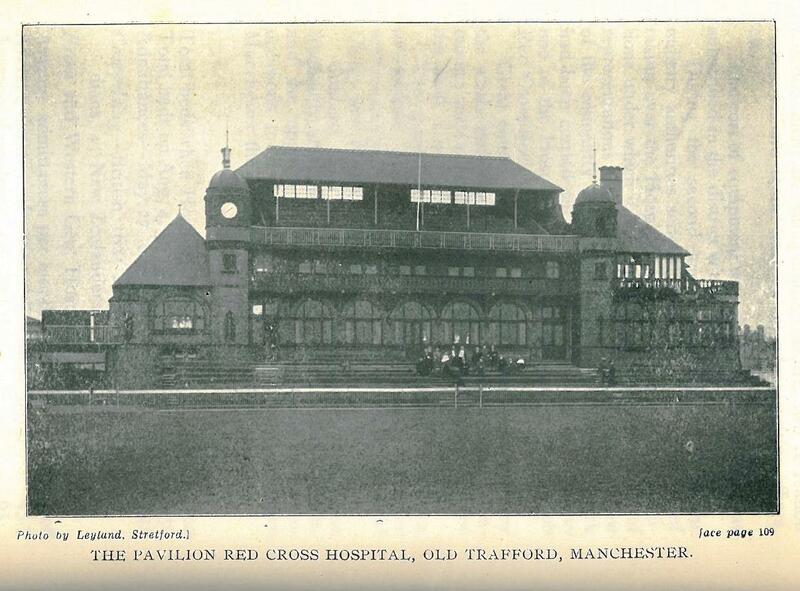 this blog was contributed by a volunteer at Trafford Local Studies. I would recommend contacting them directly via this email address- trafflocals@trafford.gov.uk including a direct link to the blog so they can try to help.